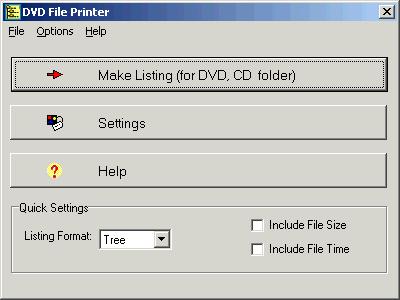 DVD File Printer list the contents of a DVD CD as well any folder or disk in a text file. You can display, edit or print the listings using Notepad, Wordpad or Microsoft Word. Output listing format in Tree View or List View. Organize your DVD CD collections. Easy to use and fast tool. Customize listings to fit your needs. List only filenames or include file size and file time. You can limit the listings by max files by folder, max folder levels and minimal file size.